We’ve recently made some important changes to the FlexTools packages. Over the past year, we have released numerous additions and updates, and we have many more in the pipeline! Rather than wait for new components and tools to accumulate, and release them as a 'new yearly package', we’ve decided that to better serve you, the additions will be released as soon as they are ready! The new features will be available as part of a new package called FlexPack Pro. All the components and tools that have been developed so far. New components, tools and features that will be released as we develop them. Edit: The latest information on what is included in the FlexPack Pro license can be found on the main page. Since November 15th 2018 we have changed the FlexPack Pro license to a yearly subscription. Read more here. WallCutter - Our major new development: People who have tried it, are truly excited, calling it a real game-changer! Let’s just say, once you use it, and see what tremendous amounts of time it saves, there’s no going back! We like to make sure everything is rock solid before it's released. Further announcements will be made when each addition is ready. Edit: Since November 15th 2018 we have changed the FlexPack Pro license to a yearly subscription after which all FlexPack Pro features will stop working, except for ComponentFinder and Zapper. You will still be able to use Flex components in your models, but they will not be dynamic until the license is renewed. After a year, if you enjoy using FlexPack Pro and want to continue using it, you will be able to renew your license. FlexPack Pro licenses purchased before November 15th 2018 - Features would continue working, yet updates would stop coming in after a year. If you’ve bought any Flex products before, you can get FlexPack Pro at a reduced price. You will get a personal promo code sent to your email during our next update. If you’ve recently bought FlexPack (starting June 21st 2018), you already have FlexPack Pro. What happened to the 'Single Component' packages? Single component packages are no longer available. We noticed that maintaining multiple products was taking too much time and effort. We will now be spending the extra time we've saved on further development of FlexTools. As we constantly work to improve FlexTools with new features, increasing your modeling productivity and saving you precious time, we truly appreciate your continued support. It’s what keeps us going! hi – I have bought Flexwindow before- would I get any discount if I buy the flesxtools now? Yes. If you’ve bought any Flex Product before you’ll be able to get a discount. We haven’t set it up yet, but we’ll send out emails to existing customers towards the release of WallCutter. If you’re interesting in purchasing now , please contact me at yoni@flextools.cc . Could you tell me the day of Flexback pro will be released? FlexPack Pro is already available. We expect to be releasing WallCutter pretty soon… and afterwards we will also release some new dynamic components. We’ll make an announcement when we know more. What is the price of the subscription after the first year? Currently it is the same price. Is FlexPack Pro fully compatible with Sketchup Pro 2019? Yes! 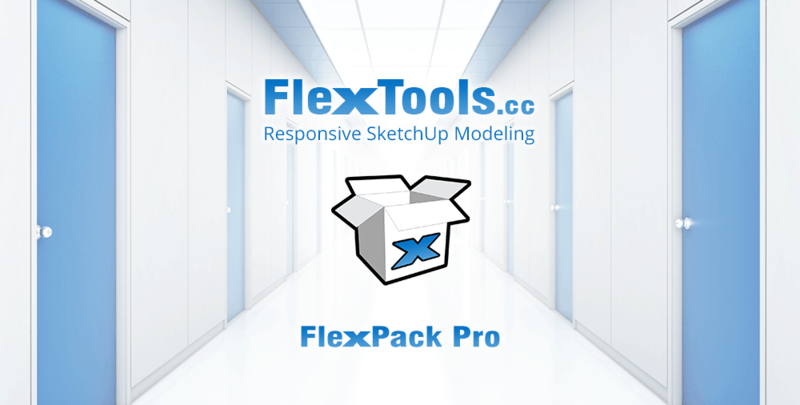 FlexPack Pro is fully compatible with Sketchup 2019.